20% VAT £3300.00 | £19800.00 inc. VAT Finance From £332.40 p/m*. Not to be Missed Great Price Range New Shape Nissan Navara, climate controlled Air Conditioning, full black leather heated elecric seats, satellite navigation, 360 cameras, M/F/S/Wheel, Bluetooth, Cruise Control, Load Liner, side steps, roof rails, Traction Control, M/F/S/Wheel, DAB Radio, Electric Windows/Mirrors, Air Bags, additional fees may apply, please note, not all cars are kept on site please call to make appointment and to avoid disappointment. pre delivery check, peace of mind with the balance of manufacturers warranty until 6.4.2019, Hpi Checked, Part Exchanges Welcome. Low Rate Finance/PCP Finance Options Available, Over 100 Cars and Up To 50 pictures Available Visit Our Website www.beckevans.co.uk call now Tel: 020 8302 0860 BUY WITH BECK EVANS A FAMILY RUN BUSINESS PROVIDING PRESTIGE SALES & SERVICE SINCE 1970 Based in Sidcup Kent Near London BUY WITH CONFIDENCE BECK EVANS A FAMILY RUN BUSINESS EST:1970, total cover/protection available, including gap rti, paint protection, extended warranties with main dealer labour rates. Keep your capital working for you with competitive payment options available from Beck Evans, let us quote you. 20% VAT £2500.00 | £15000.00 inc. VAT Finance From £245.99 p/m*. 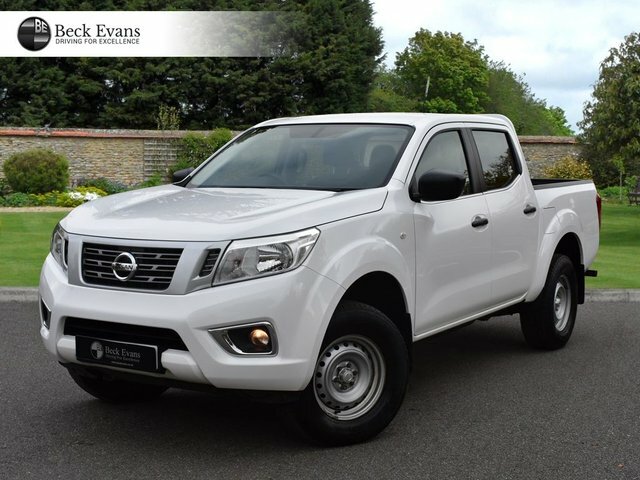 Not to be Missed Great Price Range New Shape Nissan Navara, Air Conditioning, M/F/S/Wheel, Bluetooth, Cruise Control, Load Liner, Traction Control, M/F/S/Wheel, DAB Radio, Electric Windows/Mirrors, Air Bags, ULEZ COMPLIANT! additional fees may apply, please note, not all cars are kept on site please call to make appointment and to avoid disappointment. pre delivery check, peace of mind with the balance of manufacturers warranty until 1/9/19, Hpi Checked, Part Exchanges Welcome. Low Rate Finance/PCP Finance Options Available, Over 100 Cars and Up To 50 pictures Available Visit Our Website www.beckevans.co.uk call now Tel: 020 8302 0860 BUY WITH BECK EVANS A FAMILY RUN BUSINESS PROVIDING PRESTIGE SALES & SERVICE SINCE 1970 Based in Sidcup Kent Near London BUY WITH CONFIDENCE BECK EVANS A FAMILY RUN BUSINESS EST:1970, total cover/protection available, including gap rti, paint protection, extended warranties with main dealer labour rates. Keep your capital working for you with competitive payment options available from Beck Evans, let us quote you. Japanese manufacturer Nissan is a leading producer of quality commercial vehicles, with models designed to suit a wide range of businesses from the smallest sole traders to the largest multi-nationals. Compact yet versatile, the Nissan NV200 is a small van with a big inside. An electric version, the E-NV200, produces zero emissions and is virtually silent, making early morning deliveries a breeze. Additional space is available with the NV300 and NV400 models. Why not get in contact with a member of the team at Beck Evans (2000) Limited to find out more about the current range of used Nissan vans for sale in Sidcup. All of our pre-owned vehicles come fully inspected meaning you'll be able to buy with complete confidence.